How Does One Get Over Being Home Sick? 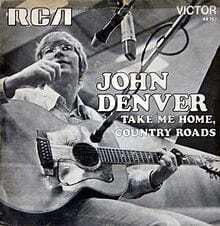 In the song “Take me Home, Country Roads” by John Denver explores the feeling of being homesick. In the first line we read “Almost heaven, West Virginia,” John Denver sets the scene of West Virginia being something of great importance to him. John Denver goes through the song reminiscing about when he lived somewhere where he thinks of as heaven. The whole chorus is about wanting to go back “to a place I belong,” to a time when he was younger and didn’t worry about anything, where you can look outside and see a beautiful view of the mountains and forget everything. Denver references the mountains in the song many times with “mountain momma,” he refers to the mountains as momma because it’s something that he can look at in most directions to find comfort in. In the lines “stranger to blue water, Dark and dusty, painted on the sky, Misty taste of moonshine, Teardrops in my eyes,” describes the blood, sweat and tears with a nostalgic tone to it, almost like he is longing for his true place that he can’t seem to find anymore. In the last part of the song he talks about regret; “The radio reminds me of my home far away,” he is regretful that he isn’t back in the place that he calls home and is constantly reminded of it because of the radio and the songs he used to listen to. When one feels remorseful about being far from their true place and belonging they can feel depressed, but with the help of hope and prosperity they can power through it.